The hepetofauna of this area is unique within the UK, and of much interest. Dorset and Hampshire has been long known to harbour all six species of reptile native to Britain, so the heathland that survived around the local area held very good populations of all three snake species and three species of lizards. Bournemouth cliffs seem to have none existent populations of snakes in most areas. Very small relict colonies of adders hold on around the Poole side of the cliffs but, none occur in the Bournemouth side. In fact not even smooth snakes occur. Only lizards occur, and in great numbers, not just the three native species but two newcomers. These two species have possibly escaped from captivity or more likely to have been released on purpose. 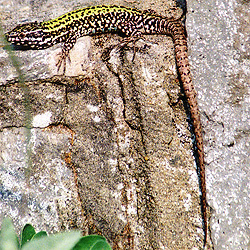 A strikingly marked and agile animal the wall lizard is represented by having many Different species and variations. Even within a local population colour morphs vary considerably causing possible confusion to the human observer. Here in Bournemouth many differing colour morphs occur, perhaps different stock has been introduced regarding different sub species, which have now interbred. It is not known when the species first occurred here in Bournemouth, but certainly in the 1970's a male was collected from Bourne valley this is not exactly the cliff top. It was taken as a male sand lizard along with other specimens and stored at The Bournemouth natural science society in a jar of formaldehyde. It was not until much later that they were officially recorded. It is of course possible for these types of lizard to naturally colonise islands. They naturally occur on the channel islands and northern France, and the colonies That do occur seem to be mainly on the south coast of England No proof has been Found that would indicate that that our animals are direct descendants of these Animals. Some colonies though are certainly more reminiscent of them, such as the Portland colony. In Bournemouth they are concentrated in two large sections of the cliff top and cliff face, the longer stretch is around the Poole chines, and the other area is between Boscombe and Southbourne cliff; the later colony perhaps displaying more variation. A very active species, it does not hibernate like our natives but remains semi-active during the winter months in sunny weather. The south facing aspect of the cliff Habitat resembles that of a Mediterranean climate. Along with many continental Species of plants and insects, our traditional heathland habitat of the cliffs is disappearing. This is a purely natural occurrence, and even if one of our protected reptile species i.e. the sand lizard is replaced, it of no great loss, as the cliff habitats are small in comparison to the much larger blocks of heath in which that species does better in terms of genetic variation and cooler winter temperatures. No proof has been found to suggest that one species is out competing another. There is proof though that the warmer climate and warmer winters are affecting our native species especially in terms of hibernation success, mainly in regards to the common lizard. This continental species has been living around the Boscombe and Southbourne Cliff tops for some years. I first saw a female in 1999. There was a report from 1996 of a dead huge all green lizard on the Portman ravine steps, but the body had gone by the time I got to the scene. Not surprising as the area is very busy with people and corvids. There has since been reports from beach hut owners of large green Lizards being seen as far back as the 1970's. Nobody has admitted to releasing them, although there are suspicions. It may well be that several introductions took place each with varying degree of success. It would seem that there is a mix in genetic make up; this could reflect the captive breeding or natural wild breeding within the colony of the different released animals. There could may well have been taints from another species the eastern green, lacerta triliniata, as I personally have Had seen several individuals that correspond to that species but have now died out During hard winters. Our climate is certainly favouring the smaller and brighter animals that are more reminiscent of the true north western variety. 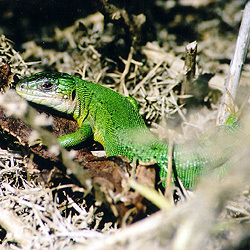 Green lizards hibernate like the sand lizard of which they are related to, but do not Specialise in sand egg laying as that species does. They are much larger than sand lizards, attaining lengths of 40 cm, but as I suggested the size is shrinking as natural selection kicks in. The smaller ones seem to have brighter colouration and the males have brighter Blue throats or in some cases heads. The larger specimens had white throats and Heads, with thicker snouts than back of head, similar to trilineata. Some individuals are very small, not much bigger than a very big sand lizard. This species has not occurred naturally in England recently, but there have been many attempts to introduce it in the past. The Victorians were very keen on the idea and many Naturalists after. No colonies succeeded or survived for very long. The Bournemouth Colony seems to be doing OK mainly to do with the climate and habitat. There were many reports of green lizards in Dorset, Hampshire and Devon during the Nineteenth century but later naturalists suspected confusion with sand lizards. I think That it is possible that we has green lizards here , either naturally or otherwise during Gilbert Whites time, as suggested in his book 'The natural history of Selbourne' and also other books dating from late nineteenth century to early twentieth. The species occurs naturally on at least one channel island and northern France. There were several attempts to introduce the species into Dorset in the past. 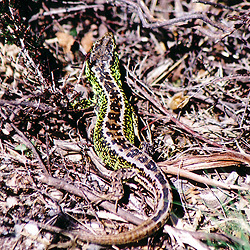 Along with wall and green lizards good colonies of common lizards flourish, and in The Poole section, sand lizards. No slow worms occur in the Boscombe or Southbourne areas of cliff top but they occur in the Poole areas. I conduct field trips to observe these species and the best time is between May and June.